Cast iron cooking grates are very hard and tough to clean. Somewhat than trying to prevent scratches, the big challenge a bbq grill made from cast iron lies with preventing rust. When you purchase a new bbq grill, be sure to follow the manufacturer's instructions for how to season your grates. As with cast iron, the first step in keeping your cast iron grates from developing rust is to season it properly before using it. First time use: Before using a cast iron grate, wash it thoroughly with a mild washing-up liquid to remove the protective wax coating applied for shipping. Rinse with hot water and dry completely with a soft cloth or paper towel. NEVER ALLOW TO RINSE DRY, OR WASH IN A DISHWASHER. Now season the grates to prevent rust and sticking. Gas barbecues: Preheat barbecue for 15 minutes; Turn burners to high with lid closed. Allow barbecue to heat grates for 1 to 1 1/2 hours. Turn all burners to OFF, and leave cooking grates in barbecue until they are cool. Maintenance (every time you grill): Don't do a burn-off after you grill, but rather leave the cooking residues on the grates to keep a protective coating on the iron. Then do a burn-off just before you grill. Brush off charred residues with a steel brush rather than a brass brush. There is a frost on my regulator. Is this normal? If your LP tank has recently been filled and you notice frost on the body of the regulator, you may have an overfilled tank. Please: Turn off the grill. Call the filling station that filled your tank and explain the situation. My grill won't light. What could be the reason? If you can light the grill with a match you may have an ignition switch problem. Check your igniter switch. Is it making a clicking noise? If the igniter does not click, it is not aligned. The Spark Electrode Tip may need repositioning in order to create a spark for ignition. Have you cleaned your burner tubes recently? It is very important that the portholes of the burner tubes are clear of any blockage. If the gas flow is restricted, the igniter will struggle to light. To clean your tubes, brush the portholes with a steel wire brush in an up and down motion. Next, check to see if the igniter wires are loose. The wires should be secured at both ends. Finally, very humid or rainy weather can cause moisture to collect on the end of the probe and make the igniter unable to spark. To fix this condition, light the grill with a match. The heat from the grill will warm the probe and should fix the problem. My regulator is loose and spinning around. Is it broken? NO. The brass nut should be 1/4 to 1/2 turn past tight. The regulator was designed to adjust to a 14oz or 16oz canister. Thus, allowing it to move 360°. Why won't the temperature on my grill reach above 350 degrees when both knobs are on high for 15 to 30 minutes? If your grill is natural gas, there could be a low gas line pressure or there could be an increase in the gas demand thus causing low gas pressure. If you do own a natural gas grill and you are experiencing low pressure please contact your local gas company. If your grill uses a LP tank, you may also be experiencing low gas pressure which may be caused by a near empty tank, a leak in tank or hose leading from your LP tank to your grill. Another issue that could cause your grill not to reach maximum temperatures could be that the tank safety feature in the regulator was activated during grill start-up. To avoid, main burners of grill must be turned to the off position BEFORE the tank is turned on. A whistling noise is coming from my grill/regulator. What should I do? Humming or whistling from the regulator: Outside temperature, humidity, barometric pressure, and the gas level within the tank may cause the rubber diaphragm inside the regulator to vibrate, making a humming or whistling sound. Although this sound may be alarming, this is NOT dangerous as long as it is not accompanied by the smell of gas. If the humming sound persists, a change in atmospheric conditions will eventually stop the vibration. Why are my burners rusting? Burners will rust. This is a natural oxidation process. Proper maintenance includes regular cleaning of the burner orifices (holes). A thin wipe with vegetable oil helps to maintain their integrity or taking a wire brush and gently scrubing the burners will remove the rust. Why is my porcelain cooking grid chipping and flaking? The cooking grids are made of stainless steel and are coated with porcelain. Once the porcelain is cracked, the heat expands the crack and causes it to bubble and when it dries it will begin to flake off. My grill has a low flame and sometimes will not light. Why? You need to purge air from the gas line or reset the Regulator excess gas flow device. Opening the tank valve all the way or too quickly is what triggers the Regulators safety device to shut down gas flow which prevents excessive gas flow to your grill. How long will my full 20 lb. Tank of gas last? Why Natural Gas Grills are more expensive then Propane barbecues? Natural Gas (NG) barbecues includes a long 10 feet Natural Gas hose and a Quick Disconnect for connecting to your home’s main supply line and a a propane barbecue (LP)includes a 18" to 28" short black regulator hose. The Natural Gas Hose and Quick Disconnect is an expensive set of gear and their inclusion makes the price go expensive. Until you have used a Searing/Side burner on a bbq, the benefits of a side burner on your bbq will always remain indefinable. Anything that can be cooked indoor can be cooked on a barbecue side burner. sauces, Pot, pan, or wok, it can handle it. Everything all in one place, you won't have to worry about food burning inside or the pot boiling over while you're outside. The side burner are powerful enough to handle anything that you normally cook indoors. Sear side burners generate much higher temperatures than normal burners and can heat up much faster. 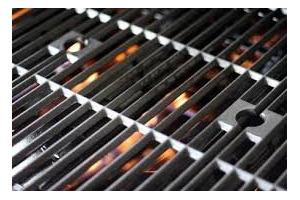 Infrared grills use less fuel,It needs less fueland can reach 1000 degrees in three minutes. Searing provide uniform heat and cut down on flare-ups. Don't strike or hit the ceramic burner with a hard object. If the ceramic of an infrared burner becomes wet while not in use can result in the formation of steam which may produce enough pressure to crack the burner. Don’t throw water onto a hot ceramic burner this will crack the mesh surface.